"You're supposed to knock before you enter!" 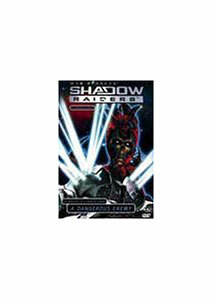 The computer animated Shadow Raiders saga continues here in volume 2 of the DVD series. While the first 4 episodes dealt mainly with introducing the characters and the formation of their alliance, their relationships with each other are tested to the maximum here. The miner from planet Rock, Graveheart, has managed to unite Planets Ice, Fire, and Bone. Although the king of his own planet refuses to participate in the alliance, Graveheart still forges ahead and tries to make the best of the situation. In episode 5, Wolf In The Fold, the first meeting of the War Planets council is interrupted when Princess Tekla, the android who first warned Graveheart of the Beast Drones, suddenly awakens from her injured slumber. Unbeknownst to the council, however, Beast leader Lamprey has possessed Tekla's body, and seeks to divide the council by inflaming the paranoia of Planet Bone's leader, King Femur. As Beast Drones attack Planet Ice, the situation becomes more complex. In MindWar, the possessed Tekla has partnered up with King Femur, who believes he's been double-crossed by the other planets. Graveheart, Prince Pyros, King Cryos, and Jade pursue Femur in an attempt to rescue him from the possessed Tekla, but find themselves unable to approach him without risking their own lives. Meanwhile, Tekla's mind attempts to battle and reject her possessor, Lamprey, resulting in a fierce battle for control of Tekla's body. J'Accuse finds Jade accused of murdering a citizen of Planet Fire. Although Fire's Grand Vizer is set on executing her, Prince Pyros decides to launch an investigation. Pyros discovers more than mere foul play; his investigation uncovers a Beast Drone army hiding beneath the surface of the planet. Perhaps the Grand Vizer will finally take the Beast threat seriously. Finally, Blood Is Thicker forces King Cryos of Planet Ice into a tough decision. Beast Drones attack Ice from within, kidnapping Cryos' daughter to make sure he doesn't fight back. Cryos must choose between defending his kingdom and finding his daughter. These tasks are divided amongst the members of the Alliance, but will they be able to prevent Ice's destruction? Again, Mainframe Entertainment provides a good, well-paced adventure story with fantastic visuals and good writing. Although designed as a kids' show, Planet Raiders does not insult with banal or simplistic plots, but tells a linear story. Nothing about the excellence of the series has changed here; the producers wanted to entertain on an epic scale for a TV show, and they succeed. The show also tries to work in messages about living with the consequences of decisions, something often ignored by modern hyper-kinetic kids' programming. Shadow Raiders is space-opera action at its best. Image Transfer Review: Another superb transfer adorns this disc, crystal clear and without flaw. The animation comes alive with amazing detail and texture, leaping off the screen with brilliant colors and image balance. There are no complaints to be made here. Audio Transfer Review: The Dolby Surround audio is very good overall. It's meaty, with good bass, but also crisp and audible at higher frequencies, with a wonderfully-rendered dialogue track. Surrounds are used for some ambient effects and other sounds. The track isn't particularly aggressive, but it delivers the goods where they're needed. Fictional "bios" of series characters. Extras Review: Profiles for characters from Planet Ice are featured here, along with rendered footage of Planet Ice scenery and machines. This is all presented very well and with very high quality. The usual batch of ADV trailers is also featured. Another good entry in this series arrives from ADV, with presentation and quality deserving of praise. Get ready for more Shadow Raiders action, on rental or purchase. Highly recommended.